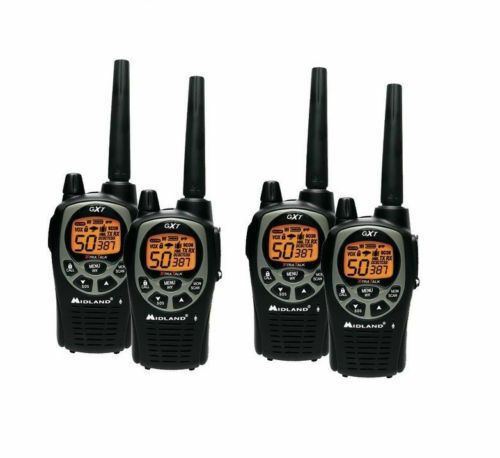 Midway’s two-way, 22-channel radios are designed for GMRS (General Mobile Radio Service) operation, in a rugged, weatherproof package. With a range of up to 36 miles, they’re perfect for most any adventure. Features include privacy codes, direct/group calling, NOAA weather radio/alert/scan, silent operation, whisper function, SOS siren, and plenty more. 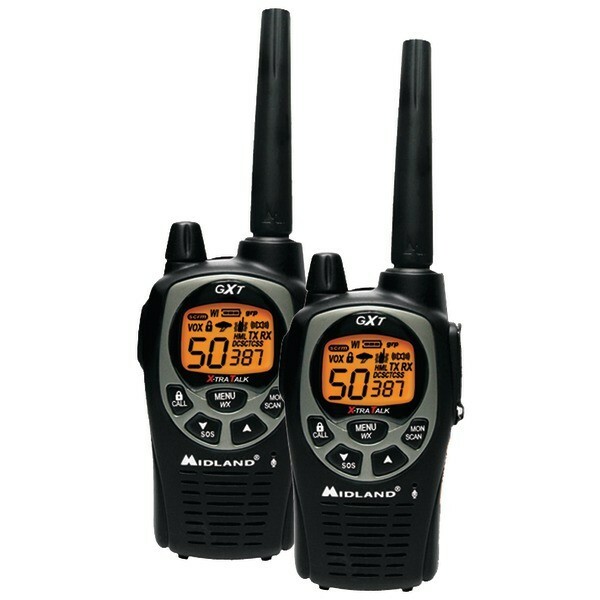 The GXT1000VP4 2-Way Compact Communication Radio ( Pair ) from Midland is a feature-packed and also easy solution to stay in touch on family trips , at amusement parks , during group sports , camping , and much more . Each radio has 22 selectable standard channels , plus 28 extra channels for extra privacy . The system provides up to 36 miles of wireless range in open areas . A channel scan feature instantly checks channels for activity , making certain you’re on an open channel for clear communication . A dual watch monitoring function will check for any activity on 2 channels . There are 387 privacy codes , giving you up to 5560 channel options to block other conversations . The radio has a weather scan function that checks the active weather channel in your area . It also has an automated NOAA alert for severe weather hazard information 24/7 . An SOS siren is provided , allowing you to send a distress/locator signal in case of emergency . An auto squelch feature removes irritating background noise for clear communication . An instantaneous call feature lets you contact one member of your party without notifying others . Call alert has 10 different call tones to notify you of an incoming call within your group . The keypad is lockable to maintain your selected settings . The silent operation mode turns off all tones for quiet , unobtrusive operation . High , medium , and low power settings let you adjust the radio’s transmit power to conserve battery life . An eVOX mode with 9 sensitivity levels provides easy voice activation for hands-free transmission only when you speak . The radio has a JIS4 waterproof rating to protect against light rain or splashing water from all directions . Mic and headphone jacks are provided , enabling you to use the radios with the integrated headsets . 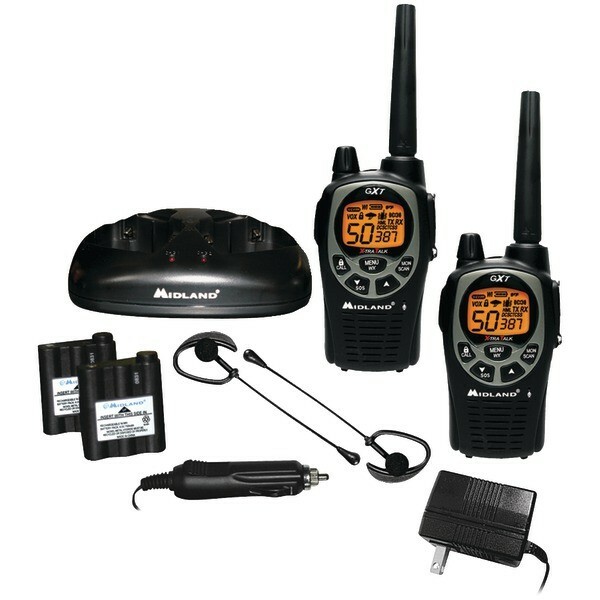 Each radio can operate on the included rechargeable batteries , or on 4 standard AA batteries . The included desktop charger and AC adapter enable you to charge both radios via a single wall outlet , while the DC adapter lets you charge a radio in a car or truck .